The apartment is Fully Registered and Licensed by the Andalucian Tourism Authority (License number VTF/MA/23587) which is a legal requirement for all Holiday Rental Properties - Un registered properties run the risk of being Closed Down and Sanctioned by the Tourism Authority Thus Jeapordising the holidays of unsuspecting guests. Copy this link into your web browser http://www.turismofrigiliana.es/ to go to The FRIGILIANA TOURISM WEBSITE - For all you need to know abbout the local area. Beach Towels - Cool Box and Ice Blocks, are provided for use by the pool or to take down to the beach. Our Private Roof Terrace (approx 25 M3) - Located is above the apartment and has dining table and chairs, sun loungers, parasols and Gas BBQ. The Balcony extending from the Living Room has table and four chairs, ideal for breakfast as the sun comes up, with stunning views of sea and mountains and by Mid Afternoon is a nice and shady retreat from the afternoon heat. We have UK Satellite TV for the live events and TV Programs in Real Time And if you have accounts with providers such as Sky Now or Netflix for example, you can still use those as well. With our FREE WiFi INTERNET ACCESS - Connect with your own devices - Or use our State of the Art WiFi Smart TV - For access to Web Browsing - Skype - FilmOn - You Tube, - Facebook Twitter and other Social apps. We have a HiFi SOUND SYSTEM in the living room that you can connect your own devices to by BLUETOOTH or by an AUDIO CABLE (Provided) to play your own music libraries or to stream online music via our WiFi. FORGOTEN YOUR DEVICE CHARGER - No Problem - We have a Device Charging Point for Android and Apple Devices. VIDEO LIBRARY - We have a standard DVD Player and a good selection of DVD's, for guests who want to bring their favourite Disks. An IPOD Docking Station is compatible with most makes of MP3 devices Ipods etc - Our CD - PLAYER / RADIO / Tape Deck is good for playing older music formats. THE LOCAL AREA: Frigiliana is a charming Andalusia village Known as the “Pearl of Axarquia” whose Moorish architecture dates back 5000 years, nestled into the foothills of the Almijara Mountains at the edge of the Sierra Tejada National Park. The older part is a mass of narrow flower laden cobbled streets winding up the hillside with wonderful views over orchards and the coast to the South and Spectacular views of the National Park North and East across the magnificent Higueron Gorge. With something for everyone Frigiliana is a paradise. For walkers and mountain bikers with enchanting walks and rides for all abilities starting right in the village. For historians and culturalists the Moorish past remains visible today. For the beach lover Nerja is a busy seaside town five minutes drive away, set amidst cliffs overlooking rocky coves with many fine beaches and all the usual facilities of a Mediterranean holiday resort, while retaining the qualities of a typical Spanish small town. OUT AND ABOUT: Within a short drive are several whitewashed mountain villages each with their own charm and many like Competa and Algaborro are on the famous “Ruta de Vino” (wine route) The awe inspiring Nerja Caves, are a fascinating, network of cathedral like underground caverns with the World's biggest stalactites. Maro,is a picturesque village with panoramic views across the sea and a small secluded beach. A little further along the coast are La Herradura and Almunecar, while further afield is the historic city of Grenada with its famous Alhambra Palace (pre-booking advised). Mijas, Antequara El Torcal National Park, Marbella, Seville, Gibraltar, Ronda, Cordoba, and other famous Costa del Sol resorts are all accessible for day trips. For adrenalin junkies like us there are loads of Adventure Sports available locally - Skiing, Hiking, Biking, Caving, Climbing, Canyoning,and Abseiling, Boz does all of these and can often help organise activities via the Nerja Caving and Canyoning club. FREE INTERNET ACCESS - The Apartment is equipped with free WiFi – However we strongly recommend that if you envisage using our WiFi system for business purposes or any other critical function that you ensure that you have a secondary source in case of any malfunction of the network. We offer WiFi Internet Access as a complimentary “Value Add” service to our guests. However we provide no technical support, nor do we accept any liability, nor will we offer any compensation, for the non functionality of the service for whatever reason. FLEXIBLE ARRIVAL / DEPARTURE :- We want our guests to get the best possible value for money, and we realize that many flight prices are much cheaper during the week rather than at weekends. So we are pleased to offer the flexibility of Midweek arrivals and departures and we will always be available to meet you personally at the apartment whatever time you arrive, at no extra cost. Hi, We are Boz and Polly from England we moved to Frigiliana pretty much by chance in 2002, and never looked back. Boz had spent 23 Years in the Royal Navy, Polly was a Nurse and later Hospital Administrator. We live in our Country Finca ( Casa Nirvana) just outside Frigiliana where our neighbours are 1,000 plus goats and their owners Julio and Lourdes, we have become fully integrated with and adopted into the local community. We make Olive Oil from our own Olive Trees and Moscatel Wine from our vines. Boz loves all the local adventure sports like Mountain Biking, Skiing, Rafting, Scuba Diving, Caving, Climbing Etc But his big passion is Canyoning where competes at Spanish National level and been Spanish Champion three times. Pollys loves are, her Home, her Animals, ( Izzy and Moli our cats and our Dog Sabrah) - Her Vegetable Plots and Gardens - Helping out at the goat corral, Milking the adults and Delivering the Goregeous baby kids - Aerobics and Spinning Classes at the local Gym and when time permits Joining Boz for a hike in the Hills. We feel very privelidged to live in such a paradise and the bonus is that we are on hand to assist with any problems you may have during your holiday and are able to offer lots of help and advice to ensure you make the most of your time in Frigiliana and the region. This also allows us to provide a superior and much more personal service to all our guests than larger travel agents can. So that any problems you may have will be dealt with, by us personally and immediately. We take great pride in the fact that you entrust us with such a precious commodity as your holiday, and it is our personal goal to ensure that every possible comfort and amenity is provided during your stay. We lived in the apartment for our first three months in Spain and have added many personal touches and home comforts to it, so that is truly a home from home. It was more of a case of Frigiliana and our Apartment choosing us rather than the other way round. We came to Frigiliana in 2002 to investigate buying a holiday home that we could use ourselves and also rent out to cover expenses. We were adamant that it was just a scouting trip and we made a verbal pact not to buy. BUT Fate took over - we bought the Apartment on Saturday 20 July, 2002.Then just two days later on Monday 22 the company Boz worked for went into liquidation. That evening after a glass of wine and doing some rudimentary life calculations we decided "What the Heck" lets go live in Frigiliana. Three months later we had sold up lock stock and barrel cashed in all our investments and were on our way. And as they say "The Rest is History" We fell in love with Our Property in Frigiliana, in southern Spain for so many reasons, it just seemed to have everything we could have ever dreamed of. We had always loved the outdoors, so with the hills of the Sierra Tejeda and the Almijada Natural Park on our doorstep, the Mediterranea Sea ten minutes away and the Sierra Nevada ski resort just 90 minutes away we could now play to our heart’s content. After our previous hectic existence, the moderate pace of life, lack of road rage, low crime levels, lack of materialism and the fact that the Spanish have maintained family life and values, was a true joy to become part of. Just hanging out here in Frigiliana there is no better way to get a feel for the life and soul of Rural Spain - Than to take an evening ‘paseo’ (wander) through the village. Join in with the locals as they parade through the narrow alleys and winding lanes, often with four generations of the same family in tow. Great grandparents with their walking sticks down to babies in pushchairs, they all stop to chat to their lifelong neighbours and friends A visit to Frigiliana would certainly not be complete without sampling some of the local delicacies. The Spanish make some really delicious food and very quaffable drinks. There’s the locally produced Frigiliana wine, made of the moscatell grapes that are harvested in August, taken to the local press in the village and then transferred to huge barrels where the juice is left to ferment for three months or more with no additives whatsoever. Another favourite is the locally produced cane honey, still made in the original factory in the village. For the carnivore, a plate of ‘Choto’ (goat) in garlic and almond sauce is an absoute must. The Axarquia region of the Costa del Sol plays host to a vast array of adrenalin fuelled adventure sports. There’s canyoning, a relatively new sport to Spain, but also parascending, skydiving, climbing a ‘via ferrata’ and kayaking. There are also dozens of caves in the area, including the world famouse Nerja Caves, that take the visitor to a whole new subterranean world with immense galleries, wierd and wonderful rock formations, and prehistoric cave paintings proven to be around 20,000 years old. The Apartment has a fully fitted Bathroom - Complete with Extractor fan - Washbasin - WC - and Bath / Shower - BY THE POOL in the stairwell we also have a Wheelchair Accessible Toilet for the convenience of our guests. All bed linen is provided, and for guests staying over seven days a change of linens and towels is provided every seven days. Enjoy VPN protected FREE INTERNET to access geographically blocked sites such as BBC iPlayer, Netflix Spotify, Etc Plus Web Browsing, Skype, You Tube, Facebook Twitter and all other Social apps. Bath and hand towels are provided as well as dishtowels and Teacloths for the kitchen - We also provide 'Beach Towels ' one per person, but beach towels are not changed after 7 days. We have a HiFi SPEAKER in the living room that you can connect your own devices to by BLUETOOTH or by an AUDIO CABLE (Provided) to play your own music libraries or to stream online music via WiFi. We have a standard DVD Player and a good selection of DVD's. The Balcony extending from the Living Room has table and four chairs, ideal for breakfast as the sun comes up, with stunning views of sea and mountains and nice and shady in the afternoon heat. Access to all parts of the complex are now fully wheelchair accessible - we have recently installed new ramps in accordance with EU accessibility rulings, which provide uninterrupted access from both the street outside and from the underground parking below. Access to upper floors is by lift and we have installed a wheelchair friendly toilet facility at the Swimming Pool level. Rent includes water, and electricity, bed linen, towels, beach towels. Arrival / Departure days flexible all year round as we understand that mid week flights are much more economical. Arrival time 16.00; departure time no later than 10.00am to allow for cleaning and preparation for arrivals. Linen and towels changed each 7 days for two weeks or more, for partial weeks at owner discretion . Extra days at pro-rata. Discounted rates for long lets in low season. A holding deposit of 15% is required within 3 days of booking. A refundable damage deposit of €150 Euros will be required prior to arrival. There is wheelchair and pushchair access from the street level to the apartment and lots of local parking. Child's high chair and cot can be provided. Complimentary welcome grocery and drinks package on arrival. Well equipped, cosy and very clean. We have visited the Nerja/Frigiliana area many times over the past few years and this is the best equipped, cleanest and cosiest apartment we have ever rented. Very quiet, with superb views we enjoyed every moment we were there. I found the apartment right away (which does not happen to me very often), parked the car right in front and was welcomed by Boz. He had already filled the fridge with everything one might need to eat and drink for the first few days. The kitchen is fully equipped for self-catering guests, with coffee, tea, sugar, spices, oil, vinegar - you name it, everything is there ready to be used. And there is a comfortable heating system that makes the apartment warm and comfortable on chilly winter evenings. If you like to go hiking, there are plenty of paths around Frigiliana and you can find lots of information in the apartment (especially in one hiking guide that gives you a short précis of each walk on pages 4 to 6). The internet, of course, is an even better source of information; i recommend wikiloc. In conclusion: I had a bloody good time and I am sure to come back. Het appartement is gezellig ingericht, voorzien van goede bedden, goede keuken, heerlijk dakterras met bbq. We hebben het hier heel fijn gehad. Thank you very much Hans, Diddy and family. for your reveiw and also thanks again for the very kind thought of bringing us some wonderful hand made Dutch Chocolates on your arrival. I have translated your review into English using Google Translate so i hope it is a reasonable translation. 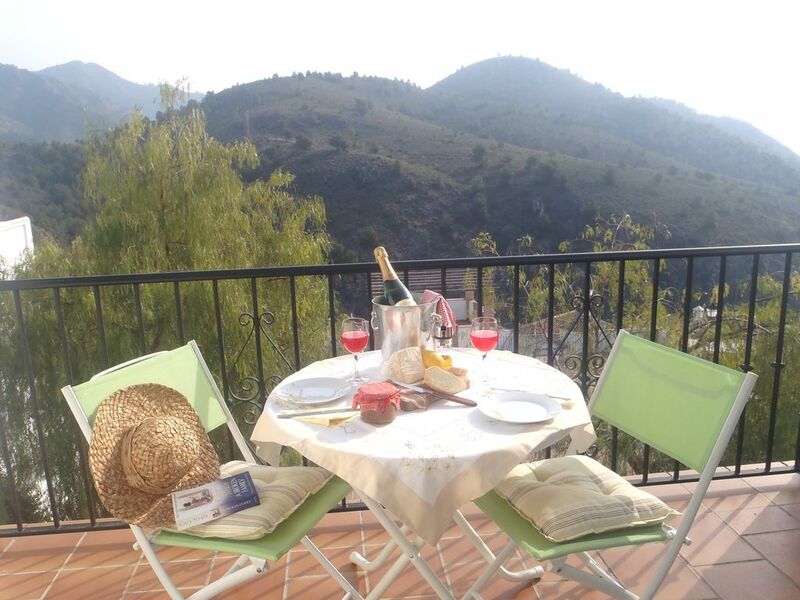 The apartment is nicely furnished, with good beds, good kitchen, lovely roof terrace with bbq. We have had a great time here. We had a relaxing stay, the views are fantastic, Frigiliana very pretty the apartment has everything you would find at your own home, the owners very helpful. The only small gripe would be the parking it’s a bit of a lottery at times, but don’t let that put you off. I would like to thank Mr Bradbury, for his comments. Unfortunately during his stay there was some work being done in the parking garage of another quite large apartment complex just down the street, which required that the garage was temporarily closed, hence there was a large rise in demand for adjacent parking in an area where parking is not normally a problem. Stayed in the apartment for 3 weeks, it is exactly as described by Boz & Polly. The location is perfect for a relaxing holiday with uninterrupted views from the balcony and roof terrace, whilst still being close to shops, restaurants and bars. There is a bus stop nearby which makes getting into Nerja very easy. Boz & Polly we’re excellent hosts and replied to our emails quickly. Would not hesitate to book the apartment in the future. We have just returned from a relaxing week in Frigiliana. The apartment is ideally situated for a brisk 20 minute walk uphill into the old town. It lacked nothing, from beach chairs and parasol to a well equipped kitchen. We were also lucky enough to be the first guests to try out the air conditioning. Boz and Polly were always at hand if we needed anything, not that we did. We will definitely be back! Firstly we would like to thank Conchita for her excellent review. However I would like to clarify one point that I have since discussed with Conchita, she confirms the following facts, and she will attempt to amend her Review above. Conchita stated that the apartment is located a brisk 20 minute walk uphill to the Old Town. Conchita here means the "Centre" of the Old Historic part of town to the Church Square, which is indeed a 20 minute walk of 1.3 KM. However in our literature we quote that it is just a short stroll the "Village Center", meaning where the Taxi Rank, Bus Stop and Main cluster of restaurants are located this is a walk of just 800 meters and takes bewteen 8 and 12 minutes depending on ones pace, over slightly undulating ground. These distances and times can be corroborated using Google Maps. We are located just a short stroll to Frigiliana Village Centre, Shops, Bars, and Restaurants, Seven minutes to Nerja beaches, Night life, and All Holiday Facilities, Fifty minutes from Malaga Airport (low cost flights), - SNOW SKIING - is available 90 minutes drive away in the Ultra Modern and vastly undiscovered Sierra Nevada Ski Resort - GOLFERS - Three 18 hole courses are within a short drive - WALKERS and BIKERS - We are on the edge of the Sierra Tejada and Almijara National Park giving easy access to lots of walks and rides for all ability levels, you can enjoy the outstanding natural beauty of the area with abundant wild flowers and wildlife - Numerous enchanting 'Whitewashed Villages' are scattered across the inland hills which are perfect for short-trips - Granada, Marbella, Seville, Gibraltar, Ronda, Cordoba and Costa del Sol resorts all accessible for day trips. Golf: BAVIERA GOLF has been designed by José María Cañizares, the prestigious professional golfer. Cañizares is one of our most international and charismatic golfers in whose record are 5 tournaments of the European circuit and 2 world championships as well as several participations in the Ryder Cup. BAVIERA GOLF is an even course characterized by its wide greens with many movements and the great variety of obstacles which offer a big range of strokes and an ideal design for all types of handicap. The variety of holes and the unsurpassed views both to the Mediterranean sea and the mountains contribute to make you enjoy and share an unforgettable day at BAVIERA GOLF. Situated at Caleta de Vélez, Baviera Golf has direct access from the A7 Motorway and is just 200 metres from Caleta Marina. From Nerja it is approx 20 minutes drive. Ski: The Sierra Nevada ski resort is only about an hour and twenty minutes drive from Frigiliana, The Base Station at Pradollano has many ski shops, Bars and restaurants There are several Ski Schools most of which have English native or English speaking instructors. The resort is very modern with the majority of lifts being five or six person high speed chairs. The beginners area is enormous and has three 'MagicCarpet' beginners lifts - For more experiences skiers the Laguna Area is a huge bowl with dozens of intermediate / expert runs. Cancelled bookings will not normally receive a refund for any monies paid, hence we strongly advise Holidaymakers to take out Holiday Insurance with 100% cancellation cover at the time of booking. However we appreciate that the unexpected can happen and so CANCELLATION REFUNDS OF UP TO 100% of the “balance only” will be considered on a case by case basis where cancellation is unavoidable and / or is due to such as death or severe illness of immediate family and which is supported by appropriate documentation, and dependent on us being able to re-let all or part of the cancelled booking. If we can only re-let a portion of the cancelled period any refund will be limited to a pro – rata amount.